Pictures of happy tandem couples? This is my favorite of us about 10 or more years ago. Phoebe and Jim at the 1998 NWTR Spokane Washington. 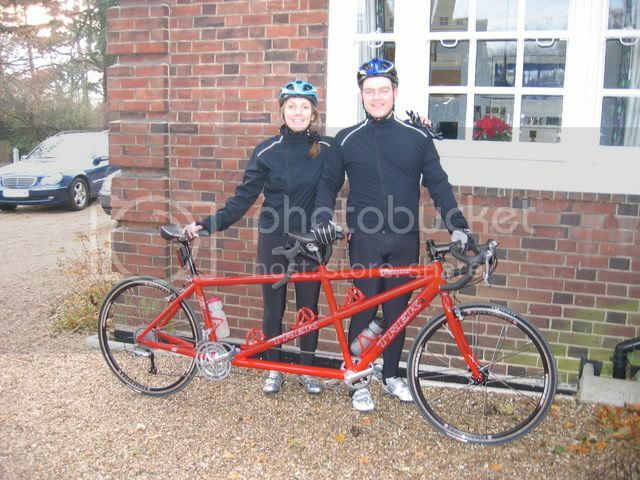 Great looking fit on the tandem! 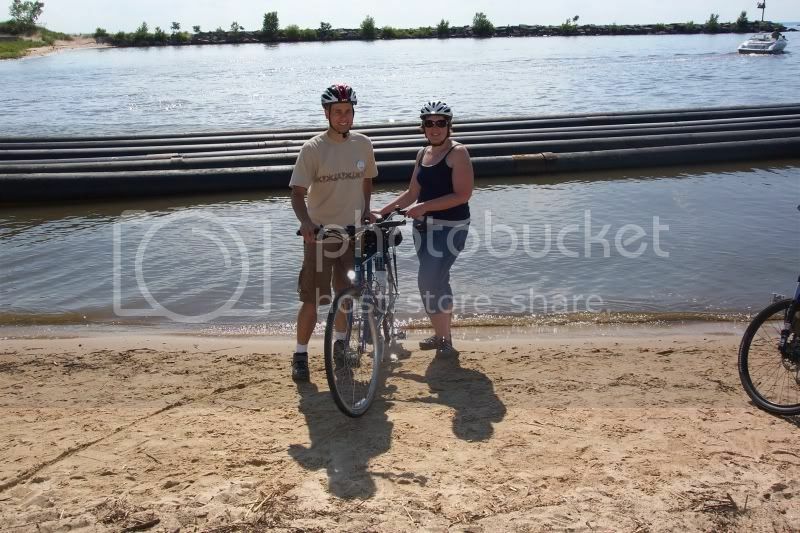 Me and my RAGBRAI stoker for this year. My 10 year old has been a challenge at times to get out on training rides, but once I get her convinced to go she is all about it. We were getting ready for a 30 mile ride in this photo. It went well today and she gave me a big high five when we finished. I'm still not sure how the second day of 83 miles of rollers on RAGBRAI is going to go, but I'm sure we will survive. Not many weeks of training left for us before the ride. I've never worried too much about riding RAGBRAI, but putting your 10 year old daughter behind you on a tandem turns the ride into a totally different deal. At the start of this year's PALM (Pedal Across Lower Michigan). The start was in New Buffalo. Happy to be finished, 6 days later at Sterling State Park, just outside of Monroe. Here's one taken today as wife and 13 year old daughter, (Maggi & Cheyenne), took off for an ice cream ride on their Santana Rio (re-worked with drop bars, ultegra brifters and road tires). The addition of the BlueAnt Interphone comm system makes it high quality mother/daughter time! Well, not a couple but since my girlfriend is pregnant right now and does not feel like cycling at all, I had to find other pilots. Whole different experience riding with an experienced racer! Here's me and the Missus on our trip up to San Francisco on -- you guessed it! -- July 4th. We got a lot of comments along the way, many enthusiastic waves, cars honking as they passed, drivers and passengers giving thumbs up. It was great to see the reactions. This shot was taken along Sawyer Camp Trail near the end of our ride. Note the clouds rolling in over the hills in the background. We rode 62 miles from San Jose to Burlingame. Later that evening we went to the USS Hornet to see the fireworks. Awesome times. OK, one more. Today, July 5th, we set out from Sausalito to Tiburon, then across the GG Bridge back to Crissy Field in San Francisco for 32 miles. By the time we got to the Golden Gate Bridge (enveloped in fog in the background of this shot), it was clear but very windy. The crosswinds were tough to deal with and the tourists were in sheer panic on the bridge. It made for an eventful ride playing "Dodge the Tourist". The Missus and I were in our Tierra Bella jerseys, from a popular ride in south San Jose. While in Tiburon we saw a bunch of ride sponsors who recognized the jerseys. Yeah, dodging tourists on the GGB is a bit interesting on the tandem. You can always yell at them. After our July 4th century. I'm enjoying the pics. 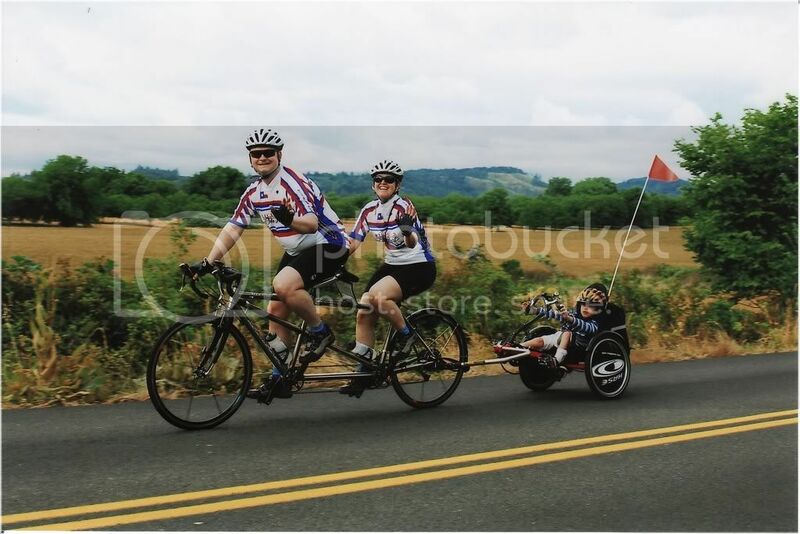 My husband and I were NOT a happy couple on a tandem - but my son LOVES it. This was taken outside some junk store in Topsail North Carolina. Hope it works. So far so good. The comment today coming home from this ride was, she wasn't really interested in riding her regular bike much anymore, and wondered how her skills would hold up in case she needed to do a ride on it. Tell her to remember to steer. Last year I rode nothing but the tandem for 6 weeks, about 4 days a week. I got on my half-bike and was cruising around the block, heading out for a ride, and OMG! I thought I was gonna crash at the T-intersection! Then I remembered that I could steer. Doh! This is us just before 72 miles of rolling cotswold hills. Let's just say we were happy to finish as we got a bit carried away in the first 25 miles. You may notice the post upgradeitis T2000. Basically everything other than the groupset parts, wheels and frame has been changed. The final stages of the disease are emerging as red anodised bolts make an appearance. Now all we have to work on is our mismatched bottles and clothes. 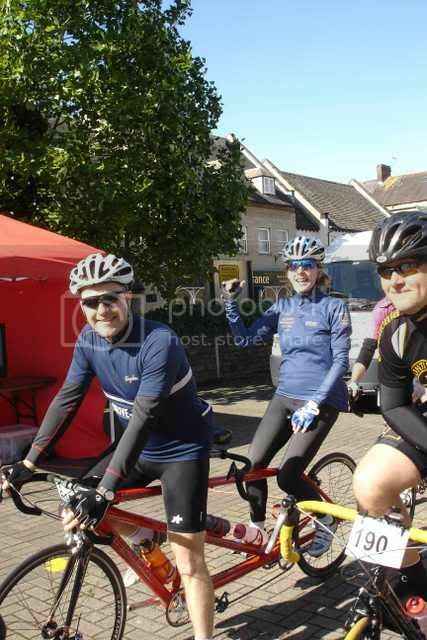 This is us with the brand new T2000 on its third shakedown ride before upgradeitis took hold. Some adjustment of handlebar angles followed. We did better on the clothes matching back then though. In action on RAGBRAI this year. We had an awesome week. My 10 year old did 400 of the 471 miles. One rest day for her mid-week. The longest day was 83 miles with 5300 ft. of climbing. We have a ton of photos on our website documenting nearly a decade of riding. In case you don't want to take time to visit http://www.s2cycle.com, here's a recent one taken during Spring Break in San Diego. This picture was taken near Marianna, FL on day 6 of our 103 day, 6200 mile trip around the US last summer. You'll notice we were still getting along and having fun. Actually we enjoyed the "close fellowship" the whole way. Awesome pictures, and even greater stories!! Keep 'em coming! Any changes to the rear brake, it's the only area I'm not happy with on our T2000. Currently running XT Canti's and a drum brake, but still not totally happy. I keep thinking disk might be the way to go, but not sure about rack clearance and it's about a $250 upgrade. I've tried the original Avids and some v-brakes, but nothing has been outstanding. I'm also thought about drilling out the bridge and running a regular caliper brake, but I'm not sure the bridge could handle the forces without some additional reinforcement.